It seems that there is no lack of opinion among people who enter sweepstakes about the phenomenon known as twitter parties. It seems they are either loved or hated. Personally, I enjoy them although I don't win as often as I would like. But, the one down side of them is they are live. Sometimes I have things planned during that time, and it means I miss out on the party. First thing you need to do is be very active on your twitter account. You don't want to have your account restricted for tweeting too much during a party. Believe it or not, I have actually seen that happen to a sponsor of a twitter party. The slang for this is "twitter jail", and it basically means you can't tweet for a certain amount of time after your account has been flagged by the computer as spam. 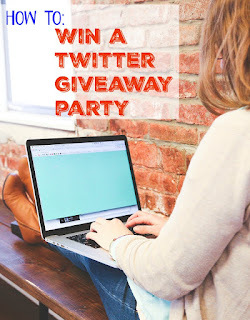 You often need to RSVP to a twitter party in order to be eligible for prizes. Usually this is just tweeting about it in advance or filling out a form online. During the party, be sure and use the designated hashtags and tag your host(s). There are so many tweets during a party this is often the only way they can track them. There are often questions you need to answer to win prizes. These might be phrased like "Q1 What do you enjoy most about summer?" Then you would start your tweet with A1 and then give your answer. One of the more fun things that has been happening lately is twitter party participants will have some .gifs and .jpg files on hand to liven up their tweets. I have to say it's quite fun to see the funny pictures as you scroll through the new posts. How do you keep up with the postings since they go so fast? I have Tweetdeck installed on my computer, but I'm sometimes a bit tech challenged, so I just as often open multiple windows on my computer. One for my notifications (you will have people chat with one another and it's a good way to see who has mentioned you in a comment.) I also keep a window open for the host(s), and finally I keep a window open for the party's designated hashtag, making sure that I have clicked on "live" at the top of the screen and not "top". I want to see all the tweets, not just the ones Twitter thinks is important. I think twitter parties are a lot of fun. They often feel like chat rooms of the old days, but we might be discussing toothpaste, a restaurant, an upcoming holiday, or something else the sponsor would like us to focus on. Where can you find twitter parties? You can search "Twitter Party" or "#twitterparty" on twitter itself. Also, Mommy Talk Show's Twitter Party Calendar and Mommy Blog Expert's Twitter Party Calendar are excellent places to find out what is going on and where. Also, be sure and follow me on twitter as I often tweet about giveaways and twitter parties. What to do when you win a prize.